In 1963 Porsche introduced the world to the 911 at a special event. This September at that same event it will show the world how far it has come. Fifty years ago a small German car company decided that the war was far enough in the past that it could move on from basic transportation and cheap runabouts. Although the car it came up with was based on the cheapest runabout of all time, the VW Beatle, the 911 would go on to be one of the most legendary cars of all time. At the International Auto Show in Frankfurt this September, Porsche will commemorate the 911 with a 50th anniversary special edition. In 1963 the all-new 911 was introduced at this very same event. To mark the date, only 1963 of the new 50th anniversary cars will be built. The 911 started as a rear drive car with a flat six cylinder engine hung out over the rear axle. To try to stay as true to its roots as practical, the 50th anniversary car will therefore not be a Turbo, or an AWD car, but will based on the 911 Carrera S. However, the cooler wide body, usually reserved for AWD models, will be employed. The 911 has continued forward from 1963 without interruption. That was almost not the case as the 911 was slated for replacement by the 928 in the late 1970s. Porsche knew its rear mounted engine shifted weight back when the car accelerated and that this lifted the front up. That tip back made steering vague. Worse, the suspension changed the angle of the wheels on the road if the car was braked in a corner (or God forbid shifted while cornering) and that this could cause the rear end to snap around. The 911 was a car with a reputation as a widow-maker and a handful to drive fast. The front/mid mounted engine in the 928 was more conventional in its handling. The suspension shared little of the 911’s design, and the car was at the time one of the world’s full-on supercars. The air cooled V8 had an almost unlimited potential for tuning, and horsepower gains, and the quirks of the 911, were solved. However, the 911's rear mounted engine helped the car brake better than any other modern design, and its rear weight bias helped it leave a corner like a cannonball. Also, some drivers who could master the way a 911 needed to be driven could work a racetrack to their advantage and dominate other cars in the class. Many drivers felt that the 911’s trade-offs were more than worth the effort and, thankfully, the 911 soldiered on through the 1970s and into the 1980s. Few other models have had such a long history. The Corvette is one notable exception, and the VW Beatle being another. The 2013 (ish) Porsche 911 50th anniversary edition will come close to overlapping the 2014s, but in the world of the 911 that matters little. Only the big redesigns really make much difference in the cars. This new commemorative edition will be available with the PDK transmission, which the majority of Porsche buyers want, and that will be the faster of the two transmissions offered. Porsche did not outright mention a stick shift in its press release, but it did not rule it out. This is no retro-Porsche. Although not a Turbo, much of the modern Porsche equipment will be on the car. Porsche Active Steering (PASM) will be available. There will be two special edition colors in grey and also a black monochrome. These three colors will look fantastic with the Fuchs-style silver and black wheels the cars come with, which will be one of the hints at old-school 911 looks. Others include green instrumentation labels with a white pointer just as the originals did, and special tartan seat inserts reminiscent of the style popular in the mid-1960s. 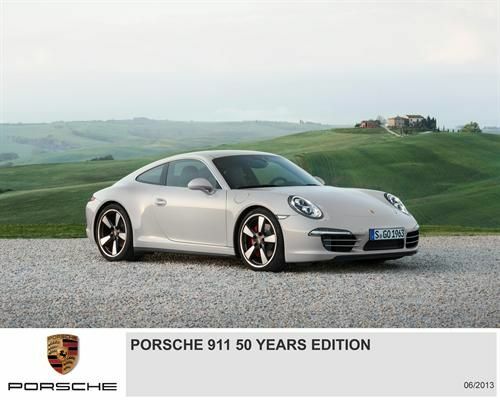 The Porsche 911 50th anniversary edition will be available to buyers this coming fall with prices starting at (starting being a key part of that sentence) $125,000.00. It is unlikely any will sit on dealer lots long.